How do you improve on one of the best flavours of ice cream known to man? That’s right. You squish it between two incredible, homemade cookies! 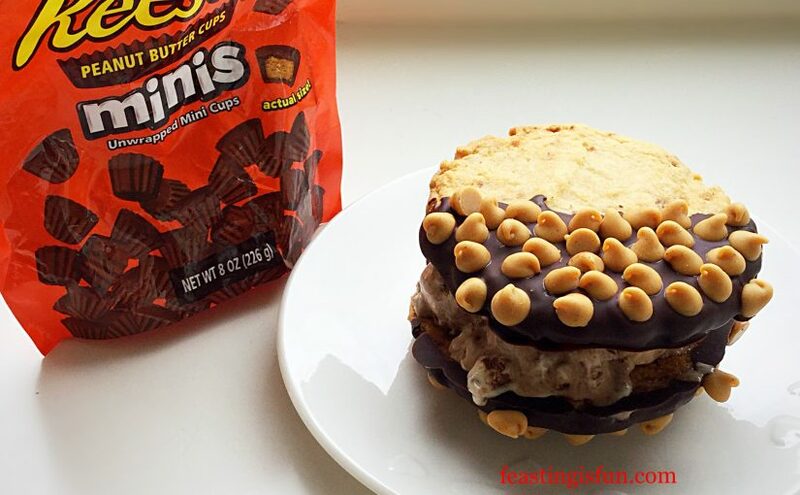 I bring you Reeces Peanut Butter Cup Ice Cream Cookie Sandwich. Oh yes people, this is the foodie equivalent of winning all the coins and one-ups in a Super Mario game and then some. Stick with me as I take you through an incredible ice cream journey. 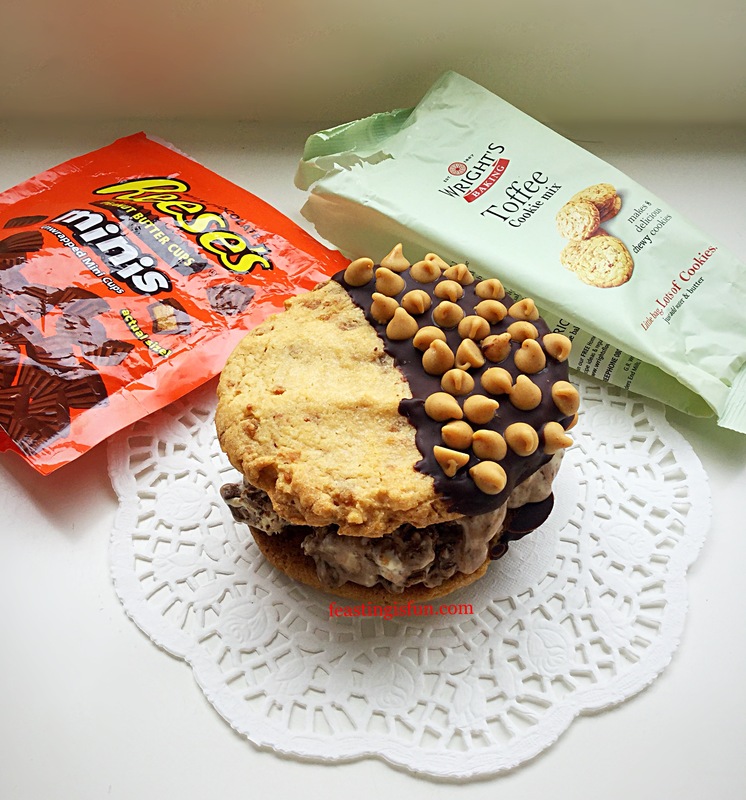 Reeces Peanut Butter Cup Ice Cream Cookie Sandwich a real dessert treat. First of all there is ice cream, packed with Reeces Mini Peanut Butter Cups. While some are mini cups are left whole, others are roughly chopped. Resulting in a peanut butter cup filled ice cream base. While dark chocolate ganache ripples through the vanilla base, with a hit of pure peanut butter in every spoonful. It’s okay. 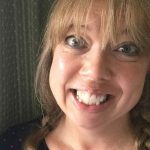 I undersrand if you want to think on that for a while? Complimenting such a flavour punched ice cream are Mega Toffee Cookies. 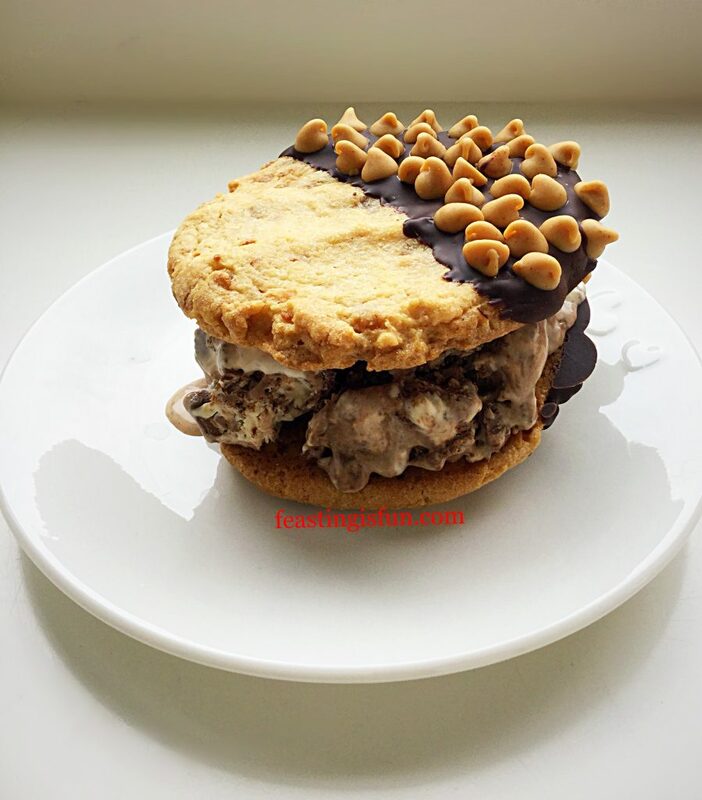 A large, robust Cookie is the only way to go when sandwiching chunks of peanut butter cup ice cream. 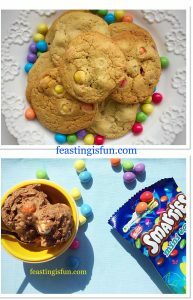 Since these cookies are double their usual size, they are perfect for creating an ice cream sandwich. 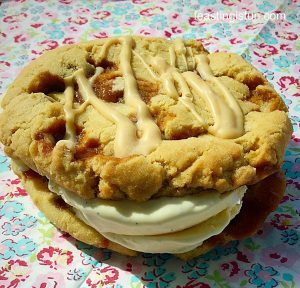 Completely sending this ice cream cookie sandwich over the top, is the customisation of the mega cookies. Dipped in dark chocolate and sprinkled with peanut butter chips, rather than contrasting, they compliment the flavours within the ice cream. Recipe: Reeces Peanut Butter Cup Ice Cream makes 1L approx. 2 x Packets of Toffee Cookie Mix by Wright’s Baking, alternatively use this recipe here. Ensure the freezing part/bowl of the ice cream maker has been in the freezer for at least 6 hours, ideally overnight, or according to manufacturer’s instructions. Note: For step-by-step instructions, including photographs please see here. First of all, Place the milk and cream into a heavy bottom saucepan over a medium heat. Heat the cream mixture to scalding point, little bubbles appear around the rim of the saucepan before the mix reaches boiling point. As soon as scalding point is reached, remove the pan from the heat. While the cream mix is heating, place the eggs, sugar, cornflour and vanilla extract into a large heatproof bowl. Whisk together until the eggs have thickened. With the whisk switched to slow, gently pour the hot cream mix into the bowl with the egg mix, whisking constantly. This creates the custard base for the ice cream. Pour the custard base back into the saucepan, place over a medium heat and stir constantly. Cook until the custard has thicker and coats the back of a wooden spoon. Remove the pan from the heat and pour the custard through a sieve, into a large heatproof bowl. Place cling film directly on top of the custard to stop a skin from forming. Leave the custard to cool a little before placing in the fridge to chill. While the ice cream base is chilling, prepare the mini Reeces butter cups. Tip out on to a chopping board, roughly divide into two thirds which will be roughly chopped and one third, which are kept whole. Also make the chocolate ganache, which will be swirled through the ice cream. Place 100g of chocolate and 100mls of double cream into a heatproof/microwaveable jug. Heat on medium for 30 second bursts, stirring after each heating session. As soon as the chocolate starts melting into the cream continue stirring until the ganache is smooth and shiny. Set to one side to cool. Set the ice cream maker up as per manufacturer’s instructions. Add the peanut butter to the ice cream base. Use a balloon whisk to break it up into small pieces within the ice cream base. Pour the ice cream mixture into the already churning ice cream maker. 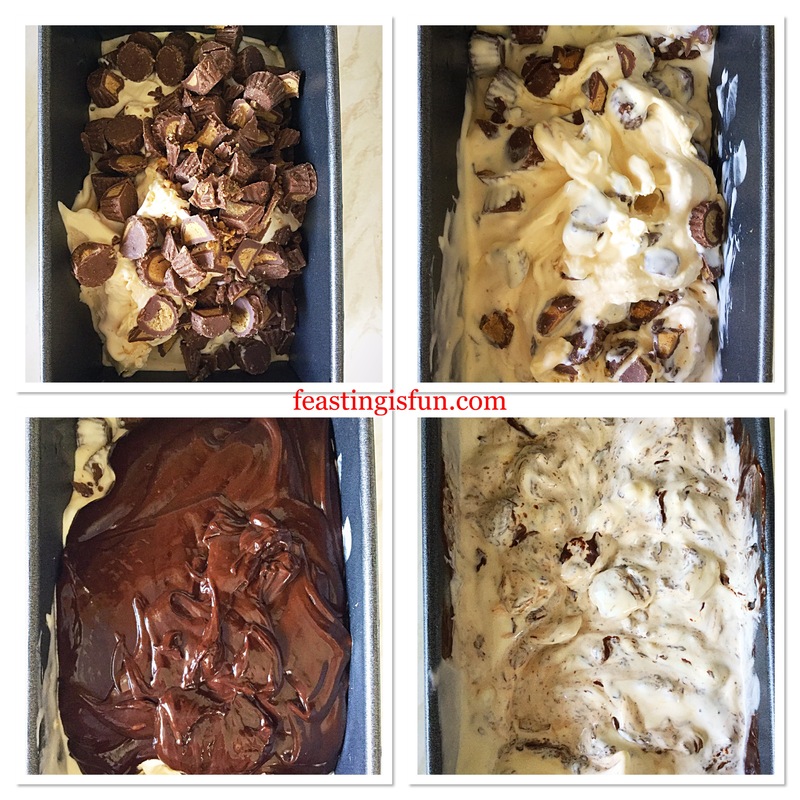 As soon as the ice cream is thickened and frozen stop the machine. Remove the paddle so the ice cream can be scooped out. 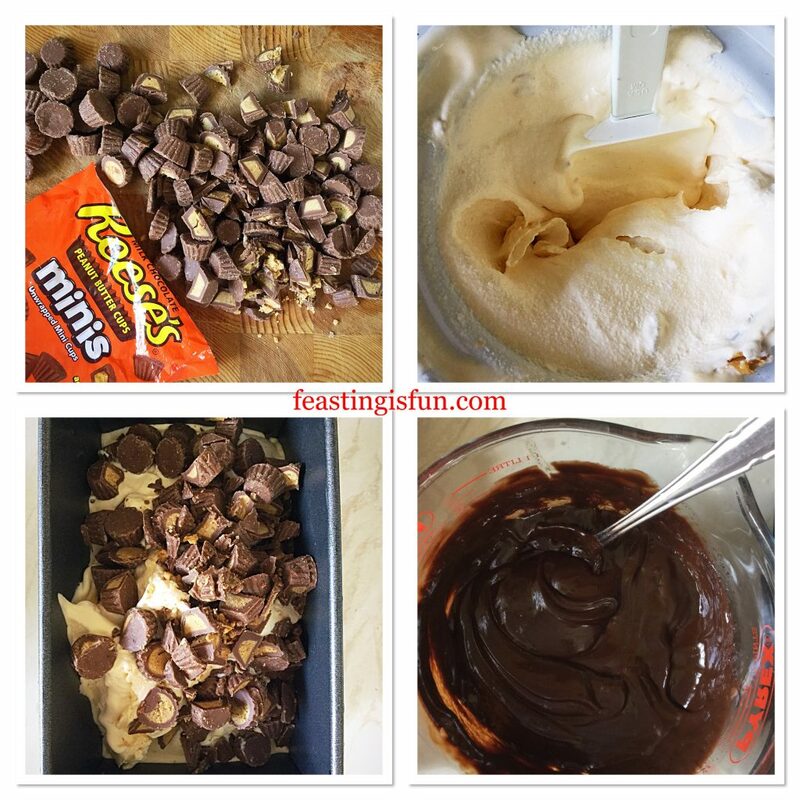 The process of making Reeces Peanut Butter Cup Ice Cream. Scatter a few chopped Reeces Peanut Butter Cup Minis in the bottom of the freezing container. Scoop half of the ice cream on top of the peanut butter cups. Add one half of the remaining chopped and whole peanut butter cups. Now add the remaining ice cream. Using the handle of a wooden spoon, swirl the peanut butter cups through the ice cream using a figure of eight motion. Adding the chocolate ganache swirl to the Reeces Peanut Butter Cup Ice Cream. Pour the cooled, yet still liquid, chocolate ganache on top of the ice cream. 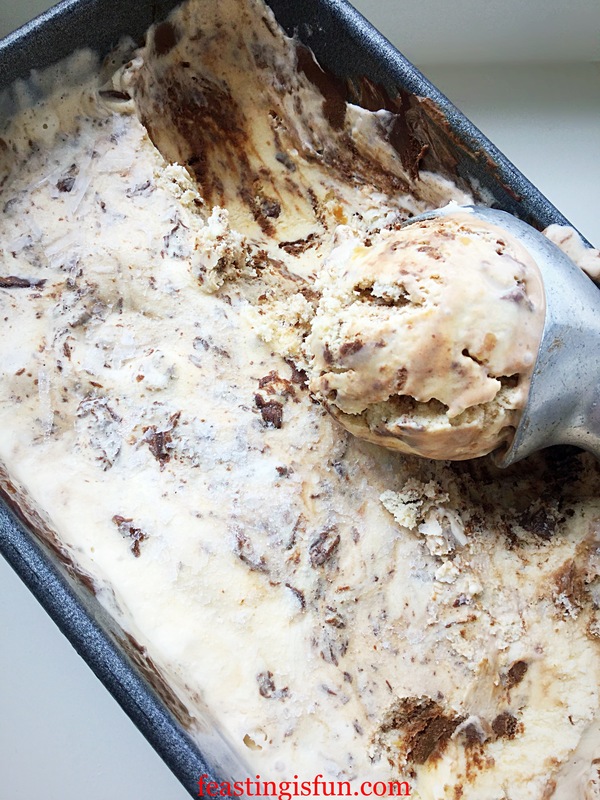 Again, using the handle of a wooden spoon swirl the ganache through the ice cream. Snap on an airtight lid, or double wrap in cling film and place the ice cream into the freezer to firm up. Leaving the ice cream to freeze overnight ensures the chocolate ganache fully freezes within the ice cream. Reeces Peanut Butter Cup Ice Cream ready to serve. To serve, remove the ice cream from the freezer 10-20 minutes prior to scooping. Allowing the ice cream to soften slightly. 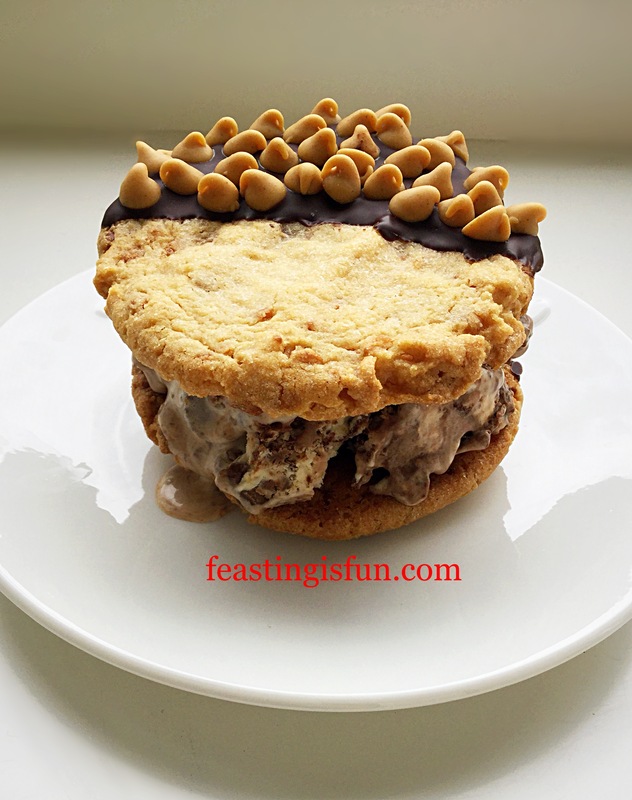 Scoop two balls of ice cream and place on one large cookie, top with another cookie and press gently to form the ice cream cookie sandwich. Alternatively, scoop and serve in a bowl with additional Mini Reeces Peanut Butter Cups. 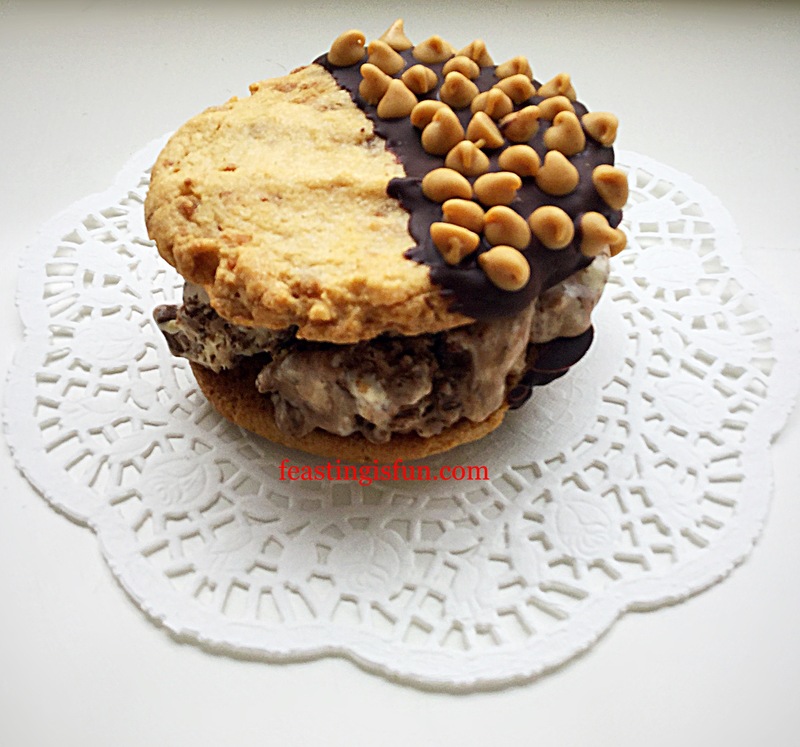 Reeces Peanut Butter Cup Ice Cream Cookie Sandwich using Wright’s Toffee Cookie Mix. 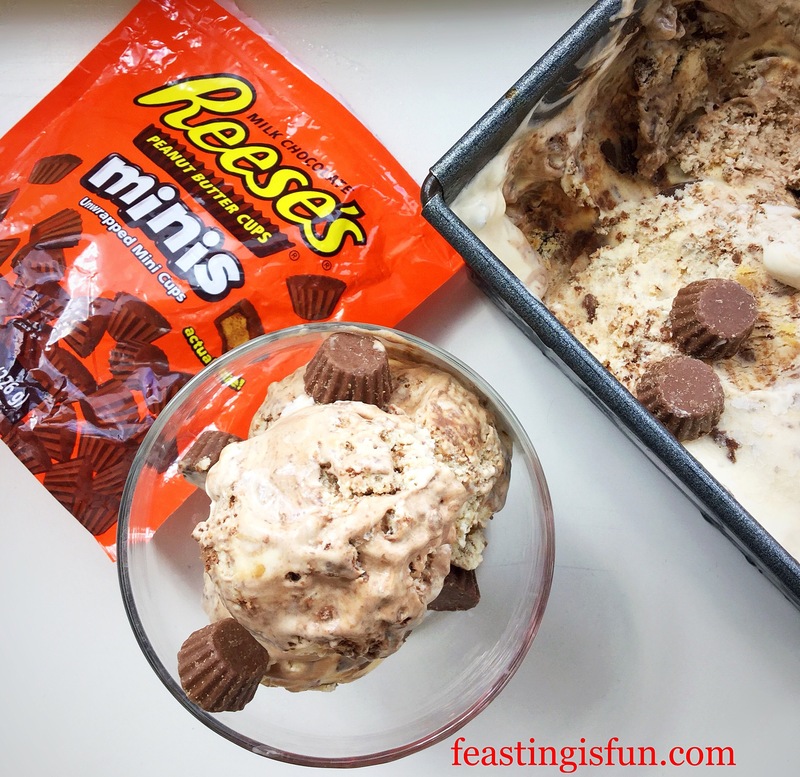 Reeces Peanut Butter Cup Ice Cream served in a bowl. Wright’s Toffee Cookie Mix is a great flavour combination to pair with this ice cream. Alternatively if you are unable to buy this mix my Caramac Caramel Cookies recipe also works well. Make the cookies as per instructions, however, for the Wright’s Toffee Cookies make them twice as big. You should get 10 mega cookies from 2 packets of mix. Bake as directed, again the toffee cookies will take 18-20 minutes to bake as they are larger than usual. Allow the cookies to cool completely on the baking tray. Melt 100g of chocolate in a heatproof, microwaveable bowl, on medium setting, for 30 seconds at a time. Stir the chocolate after each heating session. As soon as the chocolate is melted, dip each cookie into the chocolate, using a spoon to cover halfway across the top oven each cookie. 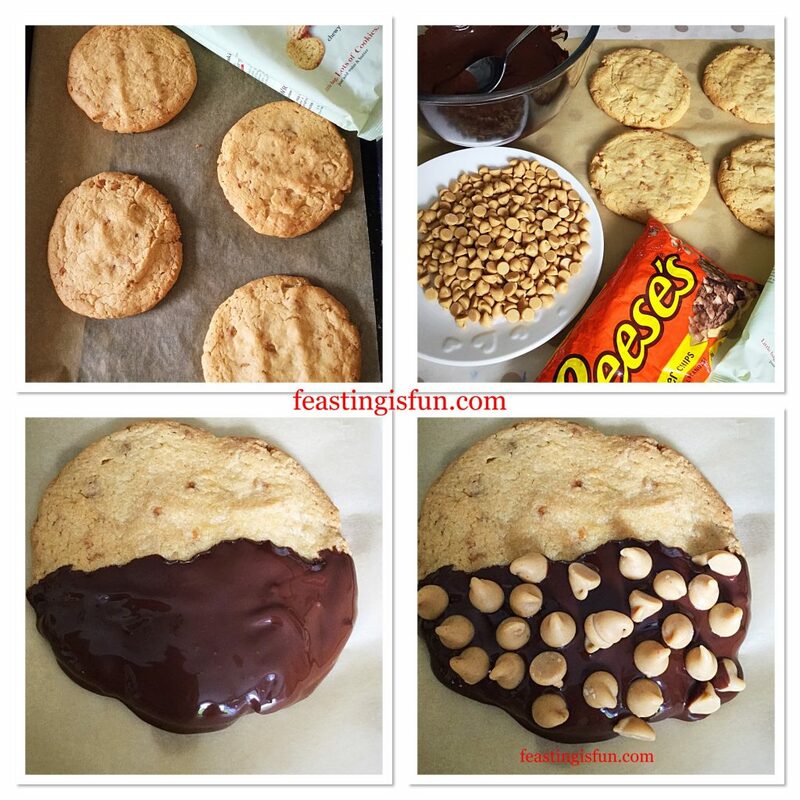 Place the chocolate covered cookies on to baking parchment and sprinkle Reece’s peanut butter chips over the chocolate covered half. Leave to set. In hot weather place in the fridge for a few minutes until set. Baking and decorating the toffee cookies for the ice cream sandwich. 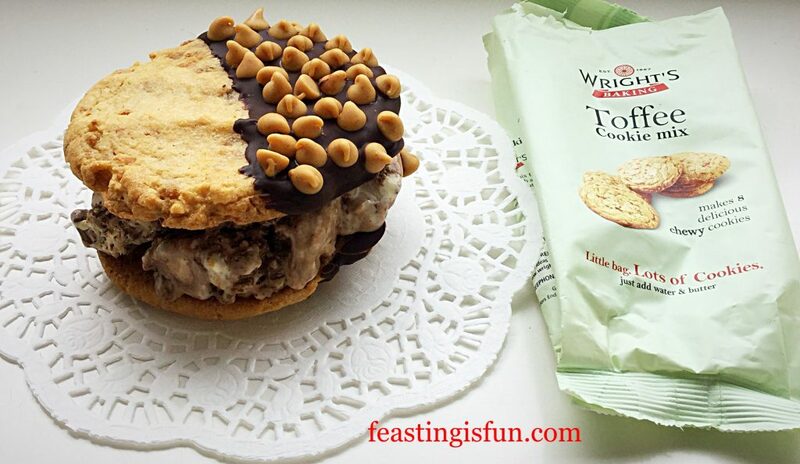 Creating the perfect Reeces Peanut Butter Cup Ice Cream Cookie Sandwich with Wright’s Baking. Such an incredible ice cream deserves a cookie that enhances all of its qualities. Caramac Caramel Cookies with Very Vanilla Ice Cream. 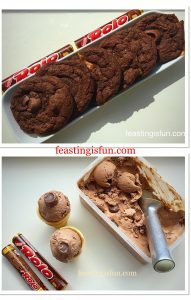 Rolo Chocolate Cookies with Chocolate Rolo Ice Cream. Chocolate Monster Mini Egg Cookies with Smarties Chocolate Mini Egg Ice Cream. Since all of the recipes shown can only be made at home, this emphasises the core beliefs of Feasting is Fun. Creating flavour combinations at home, should be fun. Each one of these examples is a feast in itself. Also, most importantly, invite your friends over to share these incredible ice cream cookie sandwiches. Finally proving that all food tastes better when shared. Wright’s Baking provided the Toffee Cooki Mixes used in this post. All recipe ideas are my own. No payment was received for the creation of this post. All views and opinions are my own. No part of this post may be reproduced without my specific written permission. Please see my Disclosure Policy. Waw! So unique & something special to savor! yummy!